All brands want to create a relevant, personalized and unified experience along their customers’ journey. And we all know that providing that experience in context to the customer is key. However, brands and agencies struggle with this due to the complex nature of the buying process today. A few weeks back we were pitching a large retailer. As we were preparing for the pitch we had lots of internal discussions related to where retail, packaged goods and e-commerce is headed. I believe the future of retail is all about providing a contextual mobile shopping experience. Let me explain. Many Canadian retailers are still lagging behind when it comes to providing brilliant mobile experiences. Often they are caught between investing in a branded mobile app or a mobile friendly website. This is one of the reasons why digital designers, online marketers and e-commerce professionals are giddy about the concept of responsive design. Whereas your website is designed to automatically reformat the content depending on the screen size and device your customer is using. But simply reformatting the content is only the beginning. The real future lies in modifying the screen content, in context, to where the customer is in their purchase journey. Contextual mobile shopping needs to take the customer’s location, social situation and task to be completed into consideration. Using the powerful sensors built into every mobile device to serve up the right message, at the right time and the right place. I have not found a good example of a retailer using responsive design in this way. However, one of the best examples I have found is the Google Now mobile app, which you can see in action in the video below. 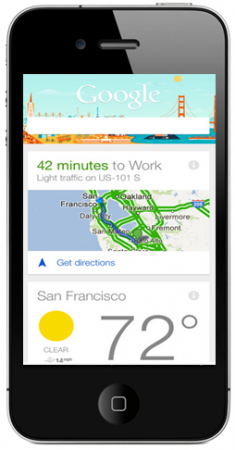 Google Now knows where you are and provides relevant content just when you need it. Real-time traffic updates based on your location; the weather based on your planned activity for the day; local coffee shops near the location of your first meeting. It will even advise you when to leave for your next appointment based on the traffic. From all of our research there is one common insight that both the customer and brand agree on: a unified experience along the path to the purchase. I believe mobile holds the opportunity to unify the customer experience. Brands need to ask themselves this question. Does our mobile strategy provide a contextual mobile shopping experience for our customers?